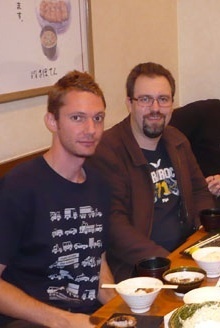 Stuart Stirling & Frank Bauer in JapanAn Aussie Internet Marketer from Japan showed me the other day his brand new 30 Minute List system and walked me through it. And I believe it’s pretty cool. 30 Minute List is free to join and allows you to build your Aweber, GetResponse, Add2it MailResponder Pro or other Autoresponder list up to 5 times faster then without this service while at the same time promoting and building your list in ViralURL. You can simply send traffic to one URL and build two lists and earn commissions with two sites faster then each one on their own. After you signup for free you need to first setup your account by clicking on “Edit My Details”. It’s just a single screen and easy to do. The picture is only needed if you plan to become a Founding member, it will then be used in the Founding members directory and in the Founding Members ads section. 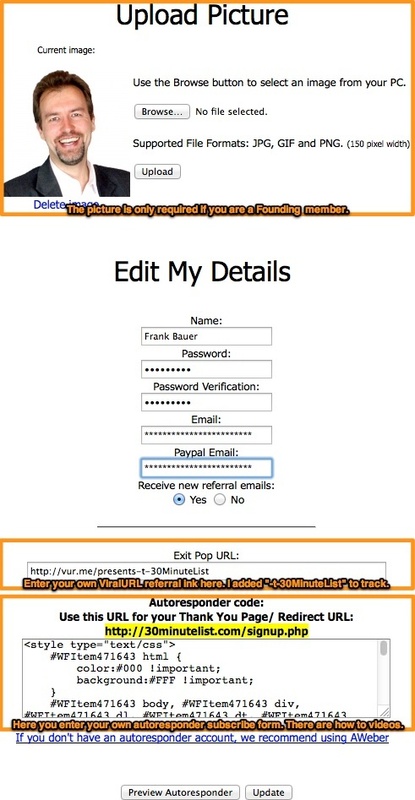 If you are an Elite or Founder member then you should enter your ViralURL referral link in the “Exit Pop” URL field. Add “-t-30MinuteList” at the end to track the results. The how to videos that show you how where to get your autoresponder subscribe form code are in the “Tutorials” section. 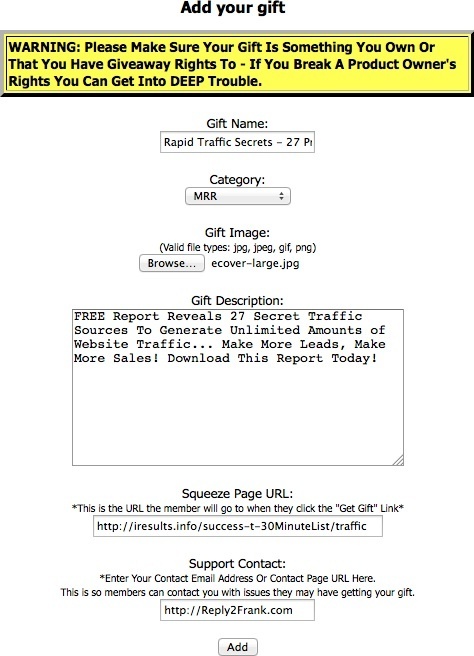 Once you added your own autoresponder subscribe form code the system is ready to increase your list building speed 5x. For all people that you refer to 30 Minute List, you will earn a minimum of 50% commissions (and up to 100% commissions) on membership upgrades, even if you yourself are simply a free member. The first 4 people that you refer to 30 Minute List will be added the the autoresponder of the person that referred you to 30 Minute List and in exchange for those 4, you will get the first 4 referrals of every single person that you refer to 30 Minute List and that way, for every single person you refer, your own autoresponder list will actually grow by up to 5 people… wow! Next you should add your banner & text ads to their system by clicking on “Setup Ads”. 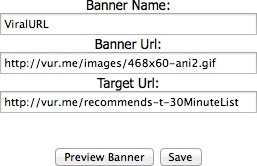 For the both ad types, banner & text ad, I recommend to enter your ViralURL referral link. Again, add “-t-30MinuteList” at the end to track the results. Finally (if you choose to upgrade) you should add your own gift for all members of 30 Minute List. You could add any other products offered freely to ViralPLR members, any PLR product you already own or any other product you have the rights for. This is another great way to build your own list not just through your own referrals, but through all referral of all members in 30 Minute List. I would say that next to the ability to speed up your list building process, this is the second best feature of 30 Minute List. If you where wondering if there are also paid upgrade options… yes, of course there are. But even the free membership option on it’s own is really useful. 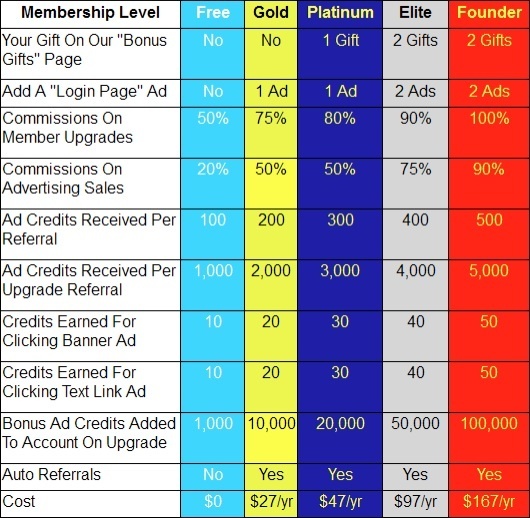 To sum it up… the upgraded membership levels give you additional advertising exposure and higher commissions. But like I said before… even as a free 30 Minute List member, you gain the main benefit of speeding up your first building efforts 5x and for that alone, I highly recommend to join 30 Minute List right away!